Karen Shields, vice president of health services at Serco‘s North American arm, has been selected for the FedHealthIT 100 list of prominent individuals in the federal health information technology industry. She oversees Serco Inc.‘s business processing, consulting and operational service offerings for federal, state and local government health care programs, the company said Wednesday. 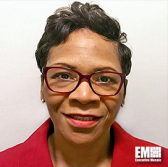 Shields joined the Herndon, Va.-based contractor in October of last year after she previously held leadership positions at the Centers for Medicare and Medicaid Services. “We are extremely proud of Karen; she has a depth of knowledge and insight in the health sector,” said Dave Dacquino, Serco Inc. chairman and CEO. Dacquino added that Shields’ thought leadership has a “positive” impact not only on the company, but on industry as well. Shields received her award at a ceremony that took place Wednesday in Washington, D.C. Tags: awardsCenters for Medicare and Medicaid ServicesCMSDave DacquinoFedHealthIT 100GovconHealthcare ITKaren ShieldsSerco Inc.